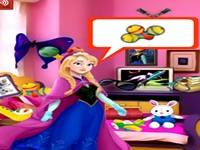 Elsa is playing in her bedroom, her favorite toys and things are hidden in the bedroom. Help Elsa to find the right object what she thinks in her mind!!!! !